In these physical worship practices, practitioners’ bodies are contoured through a variety of actions and activities—seasons of fasting, lengthy periods of standing, prostrations, bowing and kneeling, making the sign of the cross upon one’s body, receiving Holy Communion by spoon, and kissing icons, to name a few. As practitioners chant prayers, perform prostrations, bows, and other physical gestures of devotion, gaze at icons, and smell the incense that swirls around them, their senses and bodies are engaged and they, according to their own accounts relayed to Sarah A. Riccardi and Aaron Sokoll during their fieldwork in American Orthodox communities over the past three years, experience connective events with members of the celestial realm and fellow believers in their respective communities. These connections are manifested as Orthodox believers physically practice their faith at home and in the parish setting. Domestic spirituality is distinct from communal worship because of its private and personal nature, which allows for flexibility and innovation. 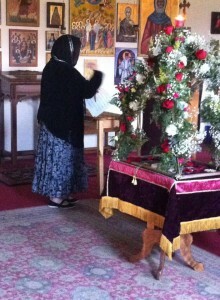 During her fieldwork at Theotokos Unexpected Joy Orthodox Church in Ash Grove, Missouri, Sarah Riccardi asked participants what sort of rituals or actions they conducted in their home icon corners, spaces that function as domestic shrines and house icons, incense, prayer books, and other ritual materiality that is used in their daily devotional activities. Riccardi’s interlocutors described the embodied actions they used in order to connect with Christ, the saints, and members of the parish. In their icon corners, practitioners of Unexpected Joy undertake the prescribed kinetic rituals—crossing themselves, bowing, prostrating, and kissing devotional items—while also incorporating actions and prayers that are uniquely situational, drawing on their own needs, desires, and sensibilities. In this way, embodied domestic prayers and rituals differ from communal actions because of the location and the personalized nature of the devotions. However, within the parish setting, adherents also engage in physical and sensorial rituals that are part of the larger structured liturgical drama. Aaron Sokoll’s current research on women’s group devotionalism at St. Athanasius Antiochian Orthodox Church in Goleta, California explores the communal and personal experiences of prayer in response to physical ailments. In this parish of converts from Evangelicalism to Orthodox Christianity, a women’s prayer group formed out of the felt need to intercede for a woman who had been diagnosed with stage four cancer. Upon hearing her devastating health news, the woman went to the church to pray with other parishioners, primarily women. Seeking guidance, the women contacted the abbess of the local monastery, and she told them, “It’s time you met the Mother of God.” One of Aaron’s informants revealed that the abbess instructed the women in the Orthodox way of praying to Mary for intercession. She said, “In order to have a relationship with anyone, you need to spend time with them… Come before the Mother of God, and be familiar with her so you can petition her and be confident in her intercession.” This particular practice of prayer required the parishioners to stand, kneel, and sing in front of the icon of Mary at the church, as well as in their own homes, for long periods of time. Furthermore, within the week, the bishop arrived for a formal visit. He met with the newly formed devotional group and brought the woman diagnosed with cancer to the front of the church, situating her in front of all those present. He stood with her in front of the icon of Mary and prayed and sang “Rejoice, O Virgin Theotokos.” While the woman diagnosed with cancer was moved by this experience, one woman in the prayer group claimed that she was transported: “He brought her up to the icon of the Mother of God and he started praying and I had no idea where I was. You know in Paul he says ‘I don’t know if I was in the seventh heaven or…’ you know in that scripture… [from] Paul? That’s exactly how I felt, and then I thought ‘This is so unbelievably powerful…’ I just didn’t know where I was. It was – I don’t wanna say a trance – but I wasn’t saying anything. I was there certainly in prayer, but the bishop started singing and we were lifted somewhere.” In all this, one can see that practices of prayer arise from felt corporeal needs and are manifested in bodily motions and presences, while also transporting practitioners through time, space, and other realities in ways keenly felt through the body. These women embody their relationships with Mary through their communal weekly prayers at the church and in their personal daily prayers at homes. In these spaces and places, the women spend time with Mary, spanning the gap in space and time through their embodied practices of prayer. The feelings of these experiences are often heightened during the holiday season. Some of the most active physical periods in the Orthodox Church are Lent, Holy Week, and Pascha. Lent, a forty-day period of strict fasting (from both comestibles and sexual activity), is a spiritually and physically intense time during which practitioners use bodily forms of prayer in order to draw closer to Christ and to prepare to participate in his suffering, death, burial, and resurrection throughout Holy Week and Pascha. During her fieldwork, Riccardi found that practitioners at Unexpected Joy saw Holy Week as a unique transportive and translocative time period, in which they are present with Christ during his passion. When the prayer was recited at Unexpected Joy, members prostrated themselves with their heads and hands flat against the floor after each stanza of the prayer. Not only do the words of the prayer suggest that God can mold the body and sensory actions; the ritual nature of the prayer causes practitioners to humble their bodies in a kinetic manner, which reinforces the potential transformative nature of the prayer. In this way, and many other ways, prayer and movement possess a symbiotic relationship in Orthodoxy. As practitioners recite the prayer and prostrate themselves, they are hopeful that God will transform their bodies, attitudes, and hearts, quelling their negative verbal, mental, and physical habits, while also imparting to them mastery over their bodily desires and emotions and providing them spiritual clarity. The final section of the prayer evokes the communal aspects of Orthodox spirituality, prompting practitioners to recall the Vespers service of Forgiveness Sunday, the final Sunday prior to the start of Great Lent, in which members of the congregation prostrate before each other and members of the clergy, asking for forgiveness of any offense. Once again, the body is used during prayer in a transformative way in order to help release individuals and the parish community from wrong doing. The prayerful actions displayed during Forgiveness Vespers have deep meaning for the practitioners at Unexpected Joy, since they serve, in part, as preparation for Great Lent, Holy Week, and Pascha, three periods of the liturgical calendar that are filled with seasonal forms of embodied prayer and spirituality. Holy Week in the Orthodox Church provides a time for practitioners to remove themselves, bodily and spiritually, from earthly life and participate in the passion of Christ through daily services both at home and at their local parish. 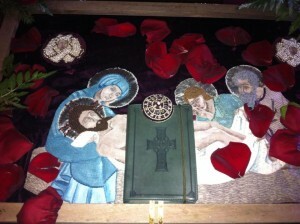 During a conversation on Great and Holy Friday, the day in which the Orthodox faithful abstain from both food and water in commemoration of the taking down of Christ off of the cross and his burial in a tomb, one of Riccardi’s interlocutors mentioned that, as she bent low to kiss the shroud of Christ in the funeral bier, she smelled the fragrance of the flowers that covered the bier and felt as if she were truly kissing the body of Christ. For this practitioner, the act of bowing brought with it a transportive, transtemporal effect that allowed her to feel as if she were fully participating in the funeral of Christ. Here we use the termstranslocative and transtemporal to refer to the spiritual movement of practitioners in the religious cartography and history of the Church, both of which are manifested in the liturgical drama and played out in the embodied actions of the clergy and the laity. Embodied prayers and rituals provide access to Christ’s life in a way that traverses both the temporal and celestial realms. Orthodox prayer, in part because of its embodied nature, allows practitioners to access times and spaces beyond their current spatial, temporal location. In Sokoll’s research, his informants echo Riccardi’s interlocutors. During prayer services, particularly on feast days, the interviewed parishioners claim revelations of clarifying knowledge or experiences of spiritual presences during heightened physical and mental exertion. One middle-aged man noted that while standing before and focusing his gaze intently upon an icon of Christ that the truth of the Orthodox faith became “really real.” Similarly, another middle-aged woman, who emphasized the kneeling in a Vesperal service of Pentecost, claimed that during that service she was overcome by the presence of the Holy Spirit. She explained, “I could not do anything but weep. It was the weirdest, most beautiful thing… The church was totally dark, and I was visited. And I became Orthodox. That’s when I became Orthodox… even though I was chrismated [six years before].” In both cases, these converts experienced their faith through embodied prayer, feeling the transformative truth of their belief and the presence of the Holy Spirit. Furthermore, both informants claim that these prayerful, visceral experiences were the times at which their conversions to this tradition became “really real” to them, if not actually enacted in that moment. From our vantage point, Orthodox prayer is embodied, for whether it is physical or sensory—visual, verbal, aural, tactile, olfactory, or gustatory—it is conducted through body and sensory outlets. Thus the practice of prayer should be examined through the lens of embodiment. As Elizabeth McAlister writes, “Studying prayer as practice means we must be attuned to embodiment. What are the learned postures, gestures and gesticulations, movements, and breathing techniques in prayer?” By investigating the relationship between embodiment, corporeality, and prayer, we are better positioned to ask questions about how practitioners inhabit or transcend time and space, and how individual actions affect both the corporate and individual religious spheres. More analysis of embodiment and prayer in Orthodoxy is needed, to explore such questions as how fasting and ritual bodily movements affect the experience of prayer and modes of devotionalism. There is much more that could (and should) be said about ways in which practitioners use their bodies to further their spiritual devotions, religious beliefs, and community relationships, but we hope that this brief glimpse into the embodied practices of our Orthodox interlocutors in California and Missouri provide opportunities for dialogue about prayer and spirituality in American Orthodox communities.